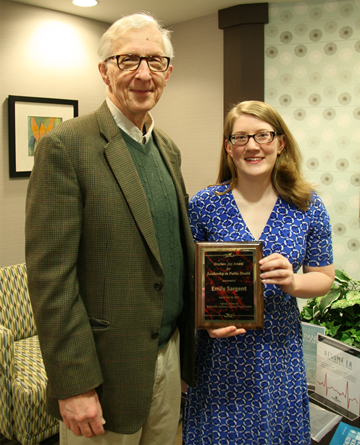 Ms. Emily Sargent was recently honored with the Stephen Jay Award for Leadership in Public Health at the 2016 Indiana Public Health Conference. This award is presented to an MPH student (across four statewide programs) who exhibits exemplary public health leadership, scholarship, and practice resulting in the improvement of public health in Indiana. Ms. Sargent is a second-year MPH student, with a concentration in health policy and management at the IU Richard M. Fairbanks School of Public Health, and a JD concentration in health law at IU McKinney. She is an active member of the IUPUI Public Health CORPS working on assignments that include researching sexual harassment/sexual assault laws for the Indiana Coalition Against Domestic Violence. She also worked with the Vanderburgh County Health Department and their community partners to draft, and later codify, a revised lead ordinance. This new ordinance now reflects the latest evidence for protecting the public against excessive lead exposure. While completing her MPH internship with the Red Cross this summer, Ms. Sargent was deployed to help flooding victims in West Virginia as a volunteer EMT with the Red Cross’ Disaster Health Services Division. She was deployed a second time to Kokomo, Indiana after the tornadoes recently ripped through the state. Ms. Sargent volunteers regularly at the IU Student Outreach Clinic, which provides services free of charge for the uninsured and underserved in our community. The clinic offers an array of interprofessional services in medicine, pharmacy, public health, law, dentistry, social work, physical therapy, occupational therapy and nursing services. Ms. Sargent is a leader among her peers, serving as vice president of the MPH Student Government. She works with the other officers to provide leadership at meetings, in social events, in service activities, in educational events, and at orientation for new students. Ms. Sargent maintains an impressive GPA and is part of the inaugural class of IU Health Law Scholars at IUPUI. For more information about the Richard M. Fairbanks School of Public Health, please visit, http://pbhealth.iupui.edu/.